Time travel and romantic comedy are genres that really ought to come together more often. If you have the power to travel back into your past and change what happened to you, why wouldn’t you do it to arrange a meet-cute with the perfect girl, or avoid that fight you regret, or even tweak your wedding day toasts until they’re just right? Handed the power of time travel in About Time, the new film from Love Actually writer-director Richard Curtis, Domhnall Gleeson’s character Tim fixates on just one thing: girls. How to woo them, how to stay with them, and eventually how to create a perfect life with one of them (Rachel McAdams’ Mary) when it’s clear she’s the one. 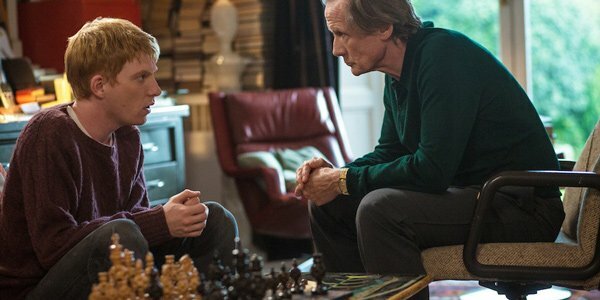 The surprise in About Time, though, is that it’s not really a romantic comedy at all but a story about family, specifically Tim’s father played by Bill Nighy, who also has the power of time travel and who helps guide his son through this fantastical new skill. How Dad has used his own powers, and to what ends, is a reveal that’s part of the emotional wallop in About Time, in which Curtis steps back to remind Tim and the audience of what he calls "the extraordinary nature of our ordinary lives." When I spoke to Curtis in New York a few weeks ago and asked him about hammering out time travel rules or which time travel films he was inspired be, he demurred; the idea that inspired About Time was a big one about life, not sci-fi, and he told it through romantic relationships because, as the writer of Notting Hill and Four Weddings And A Funeral, that’s what he knows well. Curtis’s humanism and insistence on telling stories about good people makes him a rarity in Hollywood, and one we’ll be missing soon-- Curtis says he’s retiring to focus on "more stuff like learning how to actually cook." Whether or not he actually sticks with it remains to be seen, but I was glad to snag some time with him while he’s still in the limelight, asking about those pesky time-travel rules, the movie’s surprising evolution into a family drama, his experience working with Steven Spielberg on War Horse and an anecdote about Steven Soderbergh that proves why both he and Curtis are really too valuable to be retiring on us like that. Check out our conversation below, and see About Time in theaters this weekend. There’s a million different rules for time travel in movies. It does seem like kind of a basic wish fulfillment in this one, where you get to go back. It’s kind of like what you imagine for yourself, like oh if I could time travel, this is exactly what I would do. Is there where it came from for you, kind of the idea of the fantasy version of time travel? Well, I don’t know. I think it’s a simple one. I think it’s a simple one and sort of the least sci-fi one you could imagine and you know, everything I did was trying not to get any fancier than that, in that I think if I said to you now, travel back to last week, you’d probably close your eyes and go. It’s probably the best you could do and think of it, and I didn’t take it much further than that. This is sort of an anti-time travel movie, as you can see, and the time travel was not my first thought in the movie. My first thought was the idea of how do you make a film about the extraordinary nature of our ordinary lives and that seemed a simple but complicated thing to write a whole film about. Then I thought, oh, I know, the way that I can do it is by giving somebody a choice, that they can choose any day, choose any kind of life, go back and change everything and they might well decide that it wasn’t worth doing. That’s a really broad idea to start with. Do you always start your films from big ideas like that? In this case I did. I mean, in Four Weddings, I started by thinking I’d been to 70 weddings. Notting Hill was very much, was a dream fulfillment thing driving as a bachelor to my friend’s house, as I did every Friday, thinking wouldn’t it be great if I arrived with Madonna or Lady Diana and then I tried to guess how my friends would react. This one did start from a more philosophical place. I remember, I had this lunch with a friend and we talked about out lives. We both said, we didn’t want to, if we could have one day, we didn’t want to go to Las Vegas and win a million pounds or get a phone call saying we’d won an Oscar. All of those things would be tense and nerve-wracking. You’d be with strangers and be excited. Really, the day we were having was the best day possible, but both of us realized we weren’t very happy, so I thought, that really is an interesting subject, a big interesting subject, and so I came up with this odd film to write about. When you settled on the time travel, how much time did you spend kind of hammering out the details? Did you hammer that out for yourself and figure out what to include in it? Yeah, I think so. I mean, I knew that I wanted it to be within his own life and I knew that I wanted it to be to do with love and then I thought well I was going to look at those issues. The line in the film I’m most proud of is the line when Bill Nighy says, "I’ve never met a genuinely happy rich person," because I did spend about a month thinking, would he put money on horses, would he win, would he get lots of money. Then I thought, I’ll just leave the whole money thing out and just do the love thing. How does aging work with this time travel? Because if Bill Nighy is living every single day twice, it doesn’t seem like he’s aging double for that. Does that not count against the aging? I didn’t think about the aging part. That’s fine. There’s only so many things you can actually account for. And you do, wow, it’s exhausting doing a time travel movie, because when you get to production, you know, who’s in what room when at what stage, what have they said, what is playing. All of that is complicated and all of the people you’re working with take it very seriously. Did you use any other films from the genre as references for time travel? Are you a fan of it in general? I turn out to be a fan of quite a lot of, that’s the thing. I really didn’t think about it. In the same way as, I remember when Julia read Notting Hill, her agent saying, you must have watched Roman Holiday a bunch of times, and I’d never seen Roman Holiday, and when I was doing Love Actually, I didn’t go back and watch the Robert Altman movies I had thought of. So, it didn’t really occur to me, but now I’ve finished, the one I’m interested in, oddly enough, is It’s a Wonderful Life, which I suddenly realized is a sort of time travel movie about the quality of the every day and that’s always been one of my favorite films. But I didn’t think about Looper which I loved, or Groundhog Day or Christmas Carol, which is a sort of time travel movie. Have you seen Primer? That’s the kind of the ultimate complicated one. I did, yeah. It’s really hard to watch. It’s really hard to watch and it’s also not the everyday, not the genre. Although, I think what was interesting Primer about how mundane it was. It’s true, because they made it for like ten thousand dollars. And they made it in a garage and stuff like that. I mean, I did look at Primer because I can’t remember, maybe because I did a Doctor Who episode, which is about time travel, but I remember being interested in the mundanity of it. It felt real. The way that this turns into a father-son story in the end I think took a lot of people by surprise. Did it start off for you as a romance and then become that? And then, it’s interesting that you keep it as first half is romance and then it does kind of sneak up on you, so why did that structure stick? Well, I don’t know. It’s quite odd that I still don’t know how I write a film, and I’ve written a lot of them, because they come around in different ways. Because I’m much older now, and it’s been a long time since I met one girl and thought I’d marry her, I realized that the romantic sort of comedy genre is just half the story. I suddenly realized that you have a family, you leave the family, you have friends and a girlfriend, that’s your sort of new family. Then, you get married, if you get married or whatever and you have a child and suddenly you’re starting a new family and then your new family takes care of your old family. So, actually life is romantic comedy, leading to family drama, leading back to romantic comedy, leading back to family drama, and I was really glad to be able to tell both stories at once. Did you see Domnhall Gleeson in anything that made you particularly want him for this? Well, I always hope that people in my films will be wonderful actors to start with and I’d seen him in Anna Karenina where I thought he was really remarkable, and also remarkable in playing somebody good. Which is something that is quite close to my heart, the idea that it might be interesting to study people who are doing their best rather than study people who are murdering people and then all of the little things. I’d seen all of the little things. I’d seen him in Potter. I’d seen him in True Grit. I’d seen him in Never Let Me Go, which is a film I really loved, so I kind of knew he was good, but the surprise was to find out he was funny too and he’s done lots of sketch shows on Irish telly, so he’s go that funny bone, which is so helpful in all of my films. Yeah, Anna Karenina, he’s the moral center of that movie. The weird thing was he auditioned in that beard. It was really hard to give him the part. Yeah, cause in the audition, I think we mainly got him to read the first scene with Rachel and everything and he looked, he looked like a back woodsmen in the Appalachian Mountains, who would have a big knife. He came in jeans and a t-shirt. I don’t think I knew you worked on War Horse when that came out. That movie is about people doing their best under really brutal circumstances, and that’s something that doesn’t usually work its way into your movies, and I’m wondering what you took away from that, working on that. I actually wrote a situation comedy when I was young called Black Adder, which is an English show and one series of which was set during the first world war, so I’d thought about that a lot and it has a very interesting ending and it has the saddest ending of a sitcom that’s ever been done. You seem very proud of that. Well, oddly enough, it is an interesting thing, because I think it delivered a strange shock to the viewing public of Britain, because no one knew what was coming, and they all died. So, I’ve been very interested in World War I, and I loved the book and I’d read the book to my daughter aloud, but mainly it was an experience working with Steven [Spielberg], which was a very extraordinary experience. Yeah, you guys do seem to match up well on that sort of humanist attitude towards characters. The very weird thing is I used to have in, I don’t know if it was actually in my contract, but asked for it to be in my contract, when I first signed a contract with Universal, that I should be allowed to break contract if ever Steven Spielberg asked me to do something with him. That was my one condition. Without the dream that he ever would. I just said what happens if someone I really, really wanted to work with asked me, and Steven was the example. It was interesting and he’s an extraordinary person to work with because he’s so generous with his ideas and in a conversation he will have four ideas for five minutes chunks of the movie which come off of his head. Is that not hard to work with then?R No, it’s just so refreshing that you emerge from a conversation with Steven with new stuff. Often when you’re talking to directors about things, you just feel how bad your stuff is and where is anything new going to come from, but Steven opens the fridge and takes out lots of new things and says cook a meal from that, rather than say prodding your cold dish and saying can you make it any more attractive. So, when you’re saying that you think you’re done directing, at least that’s what you have been saying, is it more stuff like that that you want to do, working with other directors, working on other people’s films? It’s more stuff like walking along the beach with Bill, more stuff like learning how to actually cook. It is life stuff that I’m really interested in thinking about whether there’s a way of focusing more on all of those things. You’re not going to use the word retirement, but it’s really stepping back from work in general. Yeah, I think it might be. Also, unless you create a hole, you won’t fill it with interesting things. It will be interesting to see whether I suddenly start to write other kinds of things or live in a different way. I wanted to create a space, because otherwise you will just go on doing the same thing. Then you have to say it out loud, so that everyone holds you to it. I did regret saying it out loud and now I’m not regretting it, because actually, when I think of an idea, as I thought of an idea for a new film the other day and then I just decided not to do it and that was fantastic, because in my old frame of mind I would have thought, that’s 2017 and 2018, and by saying I’m definitely not going to do that, suddenly 2017 and 2018 are still there with all the possibility of doing something which isn’t making another film. You and Steven Soderbergh, making retirement popular. He keeps coming back. I met Steven Soderbergh once. I was so admiring of him and I went with Julia to an ADR session for Erin Brockovich. I always take ADR really seriously, because it’s a bit of the film that hasn’t worked out and you have to get it completely right and you’ve chosen that take, because it’s the perfect tone of voice, and you want to hear that tone of voice. And I just remember Soderbergh just playing pool and Julia came in and he went, "Hi," and he said, "There’s only like four things. You know what to do and how to do it." And then he said do the first one and she did it and he went, "Playback, yeah," and then Julia, just so casual. Such a brilliance. Such a good way to live a life. If he can make movies in that mood, then maybe he should go on making movies.